Healing can be hard work; you deserve to eat something FANCY-deelish. Like Prosciutto & Sage Stuffed Chicken with Lemon & Garlic Asparagus. Woah + yessssss. This drool-worth, Spring inspired recipe by Meagan of Its All About AIP is the perfect way to treat yourself (and/or loved ones) to a posh plateful in order to celebrate your ongoing healing. 101 Recipes Organized By Season: Spring, Summer, Fall, and Winter. You’ll find all kinds of recipes including entrees, side dishes, soups, sauces, drinks, and desserts. A Super Handy Ingredient Index. Find recipes easy-peasy style based on what’s in your fridge or what you got up at your local farmer’s market. A Seasonal AIP Produce Chart. Learn what’s in season when and get inspired to diversify your diet with each new season. It’s 100% AIP. 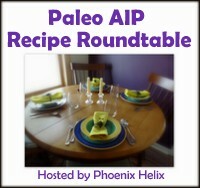 Every single recipe in this e-cookbook meets the restrictions of the elimination phase of the paleo autoimmune protocol. No common allergens! It’s an PDF E-Cookbook: Where ever you live, you can get this incredible resource: all you gotta do is download it. If you’re old-stool like me and prefer a hardcopy, no worries. There’s instructions in the back of the ebook for how to print the recipes. A collaborative work by 22 AIP Bloggers: This cookbook was written by folks who know AIP well and have used it to support their own wellness. It features recipes from many of your favorite cookbook authors including yours truly! When we know that what we’re eating supports healing it makes a difference–because intention is everything! Check out the medicinal benefits of this recipe’s ingredients: or jump to the recipe. Boneless, Skinless Chicken Breasts → Try and get chicken that’s antibiotic and hormone-free. Organic and humanly raised is ideal, but you know what you can afford: clean ingredients are important but so is working within your budget. Prosciutto → If possible opt for prosciutto from pigs that are antibiotic and hormone-free. I also highly recommend finding a brand that’s free of nasty added nitrites, like Applegate’s Natural Prosciutto which is humanly raised and Whole30 approved. Sage → This medicinal herb has over 160 distinct polyphenols (a type of antioxidant) to help fortify your body’s defenses and neutralize the free radicals that are linked to chronic diseases. When eaten regularly studies show it improves memory and brain function making it an great herb to include if you’re experiencing brain fog. Chicken Broth → I like to make my own bone broth which I freeze in small portions so it’s super convenient. Use your own or buy a good quality one, preferably organic. Asparagus → High in flavonoids and powerful anti-inflammatory compounds, asparagus also cleanses, detoxifies and soothes the liver. Fresh Lemon Juice → Improves digestion and activates digestive enzymes in your liver, also antimicrobial. Coconut Cream → Many coconut milks and creams contain stabilizers like carrageenan and guar gum to thicken them. You defiantly want to avoid those ingredients are they cause intestinal inflammation. Boo on that! Lay chicken cutlets in large glass baking dish. Season with salt to taste. Layer prosciutto slices on top of chicken, then lay 2 sage leaves on top of each piece. Fold each piece of chicken in half and secure with a toothpick. Heat 2 Tablespoons oil in large skillet. Cook chicken pieces over medium-high heat for 2-3 minutes per side or until golden brown. Return chicken & its juices to baking dish (if not enough juices, add 1/4 cup of chicken broth). Bake 20-25 minutes, basting every 5 minutes. Bring a medium pot of water to a boil. Add asparagus and blanch for 1 minute. Drain and place asparagus in a medium baking dish. Drizzle with 1 Tablespoon oil and salt to taste. Sprinkle sliced garlic on top of asparagus. Bake 10-15 minutes until just fork tender. Heat small skillet over medium heat, and sauté minced garlic 1-2 minutes. Add broth and lemon juice. Bring to a boil. Add coconut cream. Simmer to reduce to half. Stir in lemon zest. Remove from heat. Place asparagus on serving platter. Remove toothpicks from chicken pieces and place on top. Drizzle lemon cream sauce on top. Garnish with 1 teaspoon lemon zest, then lemon wedges and torn sage leaves if desired. ✨ You did it! Congratulate yourself on cooking up yummy, healthy food, give thanks and ENJOY! Whenever you cook for yourself choosing natural, healing ingredients you are showing yourself incredible love and kindness. And you are ALWAYS worth it. Do you know deep down that you’re worth the time and effort it takes to prepare healing food? Is home cooking is an act of love for yourself (and/or others) or does it feel more of a chore?